Danica who? What about Shirley ... and Shirley? And Judi. And Judy? So, Danica Patrick is the first woman to win a major auto racing event, is she? Hmmmm. I’d better get Shirley Shahan on the phone and let her down gently. “You know that Winternationals title you won FORTY-TWO years ago … "
My e-mail just about blew up this weekend with fans sputtering in outrage, which is cool, as always to see. Our fans, more than in any other sport I can think of, live and die with the recognition of successes – and the slaps in the face of nonrecognition – of the sport. There’s no doubt that Ashley Force is a striking young woman, but her victories in AOL’s Hottest Athlete and Q95’s similar contest were as much a tribute to the voting power of NHRA fans as to her good looks and popularity. The 1966 Winternationals will be remembered for a lot of things. A year after he had tuned Don Prudhomme to his first win, Roland Leong powered Mike Snively to victory in the Hawaiian Top Fueler, and Gordon Collett collected what would be the first of three straight Winternationals titles in Top Gas, but there’s little doubt that anyone who watched it happen on ABC’s Wide World of Sports or were among the record-breaking three-day crowd of more than 90,000 at Pomona Raceway didn’t know they had witnessed a little slice of history after watching Shahan, a 27-year-old housewife and mother of three, pose in the winner’s circle with her Drag-On Lady S/SA '65 Plymouth. Sure, there was probably some grumbling from the Neanderthals that “wimmen need to stay in the kitchen” – after all, this was before the Women’s Lib movement -- and it had been less than six years since this little gem appeared in the Aug. 12, 1960, issue of National DRAGSTER, just before that year’s U.S. Nationals: “One of the restrictions to be in effect at the National Drags this year will be the exclusion of women drivers in any class of competition. The girls have been allowed to drive at previous Nationals events, in the street classes only, but last year's experience in which the meet's sole accident involved a female stock car driver prompted the new ‘no gals’ edict.” But Shahan’s win inspired a lot of people, not all of them female. Shahan had made her first trip down the quarter-mile behind the wheel of husband H.L. Shahan’s ’56 Chevy 10 years earlier, at age 17, and she had won Super Stock at the 1959 Bakersfield event – with a stick shift -- so she was no fresh-faced rookie or publicity stunt for Plymouth, whose PR ace, Sam Petok, had bestowed upon her the nickname that would serve as her calling card. 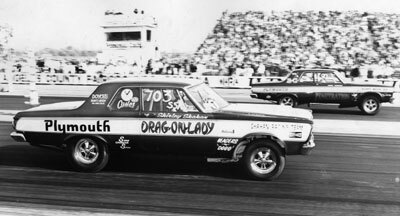 She later drove in Pro Stock with an AMX, but her career was short-lived when her husband opened his own engine-building shop for a circle-track team. In Bob Post’s High Performance book, Shahan is quoted as saying that her win in Pomona “was about five years too soon … If it had happened later, in the women’s lib era” her racing career might have turned out differently. 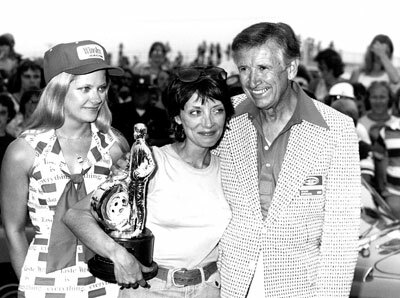 Even if you dared to dismiss Shahan’s win as being in the “amateur” classes of NHRA racing – as well as Judi Boertman’s Stock win at the 1971 Summernationals or Judy Lilly’s Super Stock victory at the 1972 Winternationals -- and even if you read some of the more tempered Danica hype that said hers was the first female win in an open-wheel racing class, I don’t recall Shirley Muldowney’s dragster running fenders when she stomped the boys in Columbus, Ohio, in 1976 -- oh, about THIRTY-TWO years before Danica’s win. You remember Columbus 1976, right? Muldowney qualified No. 1 by a half-tenth, set low e.t. (plus had low e.t. of every eliminations rounds) AND top speed, and then reset the track record in the final round. All in a day’s work. I don’t know Danica Patrick, but my guess is that she’ll never be named to the top five racers in her sport as Muldowney was in ours in 2001. You had to love the response from NHRA’s Communications Department that appeared on NHRA.com after Patrick’s “breakthrough” win. A nicely worded congratulations and a subtle reminder that, “Oh yeah ... women winners? We’ve had a few.” Like more than 40! It’s funny to me that this all comes the week after I wrote a Staging Light column for ND about Ashley Force and the surely coming histrionics of her first Funny Car win. As momentous as that moment will be – and for whatever you might think about the difference between driving a Top Fueler and a Funny Car (or a stick-shift Super Stocker for that matter) -- Ashley will know that her win is another building block in the wall of history that women have erected in our sport, just another gap filled in an impressive historical structure. Ashley has already made history twice in Funny Car – at last year’s fall race in Las Vegas, where she became the first woman to reach a final round, and at this year’s just-completed spring event in Vegas, which she left with the points lead, the first by a woman in the class (and making her only the seventh woman to do so in any NHRA Pro class) – and the way that her team has that Castrol GTX machine running, it seems like only a matter of time before she’s hoisting the Wally in the winner’s circle while her proud papa, 125-time class winner John Force, beams proudly in the wings. If – when – she wins in Funny Car, she’ll be the 10th woman to win in a Pro class -- or if Melanie Troxel beats her to it -- and you can bet that there will be a long line of women – and men -- smiling in appreciation, dating back to well before 1966.